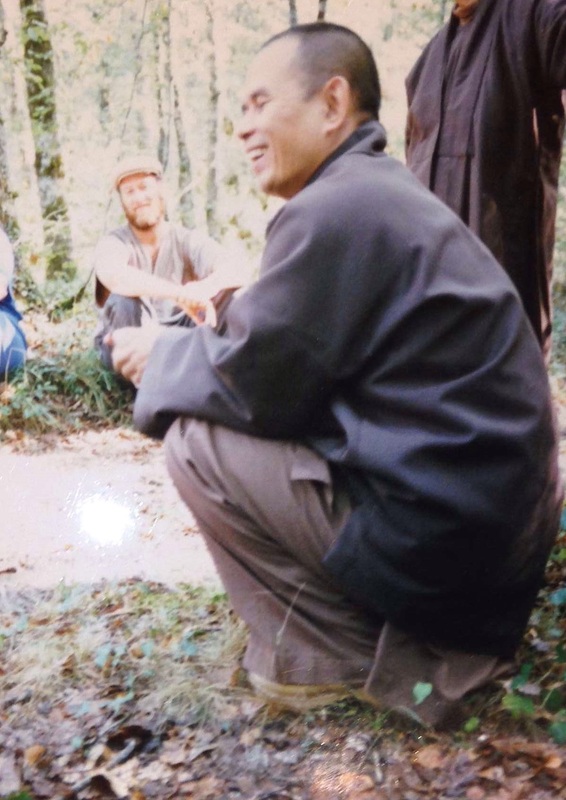 In the 1960’s Thich Nhat Hanh came to the US to speak out against the war raging in his country. One of the people he influenced was Martin Luther King, who did go on to oppose the war. Dr. King later nominated Thay (pronounced Tie, meaning teacher) for the Nobel Peace Prize. Thay spent some time with Dr. King and his extended community, a warm group of affectionate people who liked to hug each other. 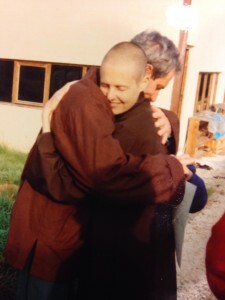 Being a Buddhist monk, Thay was not supposed to touch people, especially women, but kindness is also an important trait to cultivate, so he felt uncomfortable whether he hugged or not. Breathing in and out, we are here alive and together. In the “advanced” form of hugging meditation, we share a fourth breath and remember that all things are impermanent, including both of us. While I only rarely practice formal hugging meditation these days, I am usually very conscious of the preciousness of the moment of hugging someone and the importance of bringing my whole presence to that person and feeling them holding me. This entry was posted in Meditation, Mindfulness and tagged Impermanence, Mindfulness, Thich Nhat Hanh. Bookmark the permalink. A great way to hug when formal type is necessary! Of course for me I am fortunate to be able to hug with most people and relatives..they know me and have learned there are not many ways they can get out of it! We all benefit from touching and being touched, especially when it is done with awareness. Keep hugging! This is a beautiful story. I live in a land now where hugging isn’t as common as it was when I was in Reno. You may not practice formal hugging meditation often but this friend would appreciate a hug from you that way. I’ll do the same for you now. With much love. I believe in virtual hugs too. I felt yours to me, sending one back! But after reading your post, that’s not necessarily the only explanation. This preschool is a very warm and loving environment . . . and I’m grateful they’ve learned to embrace their friends so directly and so warmly. What a beautiful story, Karen. Thanks for posting! What a wonderful thing to ponder…I’ve always been a hugger! Touch can be so powerful, especially when it comes from a place of kindness. Love the hugging meditation–Thank You Kathy! And I’m so glad I found a photo of a nun hugging a guy!